Why does food cooked and served in a diner taste so much better than the dinners you can have at other restaurants? Is it the 1950s throwback décor? Could it be the experience of sitting in Naugahyde-covered booths or eating at a real lunch counter that makes it taste like a little slice of Americana? The true secret to those awesome breakfasts and lunches that they serve at diners is a lot more simple and it explains why so many customers become regulars at these special restaurants. Many of the recipes that are used in diners today are the same recipes that have been used for decades. Cooked the same way, using quality ingredients, patrons return to these establishments on a regular basis to have the foods that remind them of their childhood. 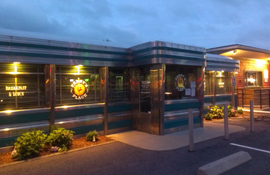 Some diners, like Persy’s Place in East Providence, Rhode Island, even use family recipes that have been handed down and perfected over the years – some of which even become legendary in the community because of their unique regional flavors. When you walk into a diner you know what to expect. Even if you’ve never been there before there is a collection of typical “diner foods” that are traditionally served. The lunch menu will always at have burgers, stacked sandwiches on toasted bread and golden french fries. Breakfasts are usually much more elaborate, consisting of a variety of pancakes, eggs, waffles and powdered-sugar-dusted French toast. Much of the food that you will find in a diner is cooked on a grill or griddle, as they were the primary means of cooking in the early days of American diners. Desserts are another diner staple and you can usually count on finding a large glassed-in display case or see pies under glass at the lunch counter. Its rare to walk into a diner and not be immediately hit with the aroma of a freshly brewed pot of coffee. Iced tea, soft drinks and milkshakes are typical too, but some diners offer another blast from the past: ice-cold bottles of Coke, Pepsi or root beer. Diner food is usually inexpensive compared to other meals in the local area, consisting of a breakfast item or sandwich, a side dish and a drink for the average cost of one hour’s worth of minimum-wage income in the area. A typical diner experience has the customer leaving full and satisfied, and you will often see people taking home portions of food that they were unable to finish. Diner lingo is also an interesting and unique aspect of American history. Waitresses use creative code words to expedite orders to the cooks, terms that have been taught and handed down throughout the years. For example, an order of milk is called “baby moo juice” or “cow juice,” depending on the region, and a side order of “bullets” or “whistle berries” means you’ll be getting baked beans with your meal. A glass of water is “city juice” because it usually comes from the tap and don’t freak out if your waitress asks for dog’s biscuits to go with your chili, that just means crackers. In addition to the foods mentioned above, most diners have special menu items that reflect the region that they serve. For example, east coast diners popularized the patty melt and coney dog, while diners in the south serve up delicacies such as biscuits and gravy and chicken-fried steak. Depending on where you go, you can order items that reflect cultural influence in the area, such as German, Polish, Greek, Jewish or Italian. In our local area you will find a smattering of food items that are definitely common to the northeastern states that you won’t find anywhere else. Diners in Maine will often serve fried seafood, such as clams or shrimp. New York diners are known for their amazing varieties of deep dish cheesecake and they serve up a popular egg-and-cheese sandwich in New Jersey that fans will drive miles to eat. Persy’s Place in East Providence, Rhode Island serves up family recipes that come with a serving of Boston baked beans and a big hunk of grilled cornbread – unique side items that you just won’t find anywhere else that have become a distinct part of the local cuisine.